Did you play underneath the arches? This Church arch featured recently as a “Picture from the Past” in our local newspaper, the Express & Star. Apparently this Gothic arch and the remains of a church wall were; when pictured in 1963, lying derelict on a site designated for a new building project in Finchfield Road known as ‘The Orchard’. According to Canon John Brierley rector of Wolverhampton at that time arches such as these have been sold throughout the years as St Peter’s Church has been renovated. So this article got me thinking; I just wonder what small fragments of these historic treasures lie tucked away as garden walls and ornaments around our City today, brought about by those with a lack of foresight who decided to improve the old town in the last quarter of the 20th century. Thank God we still have our oldest church and in my opinion; the nicest in the county. St Peter’s Collegiate Church which has been part of of Wolverhampton since 1425 and lies in the heart of our city. Built on the site of the original minster church and was later rebuilt by Lady Wulfruna. Today this picturesque church, its gardens and fountain are a much loved part of our city and create a calming contrast to the hustle and bustle of the shops and businesses which surround it. Over the course of the next few weeks, I would like to give you a study of local Church buildings, and their environment that once brought character and life to our city centre. 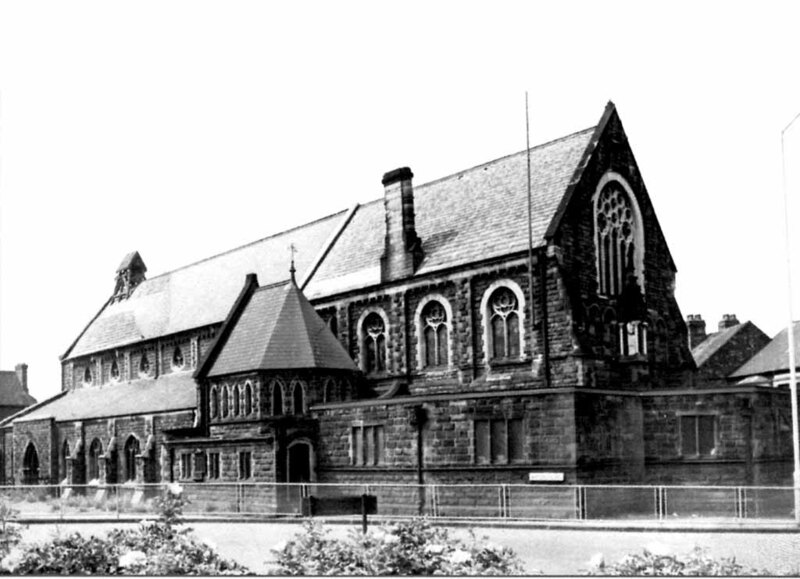 Perhaps knowing the fate of these many Victorian Churches made redundant and lost in the 1950’s and 60’s, may serve to stimulate a more enlightened interest in the preservation of those that survive. 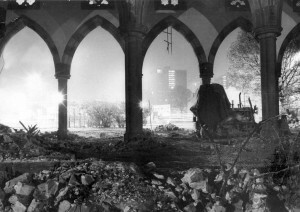 Lights from around the Five Ways and Waterloo Road in particular, coupled with an October mist lend an air of mystery to this late-night picture taken from inside Christ Church, which was being demolished in 1975. 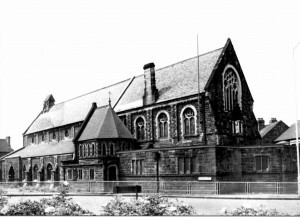 Christ Church, at the bottom of Waterloo Road was erected mainly through the exertions of the then rector of St Peter’s, the Venerable Archdeacon Iles, and was formed in 1887 into a vicarage. The extensive building of the Great Western Locomotive works had caused the necessity of a church to be needed here, at the five ways. 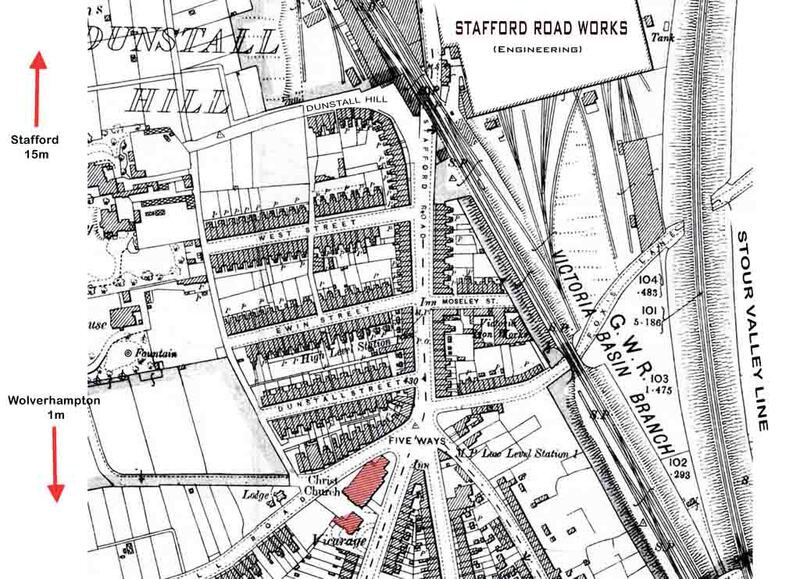 Five ways at lower Stafford Road showing the site of ‘Christ Church’ made redundant in the 1960’s. This road junction was the hub of the local community living close to their places of employment in this once heavy industrial zone. 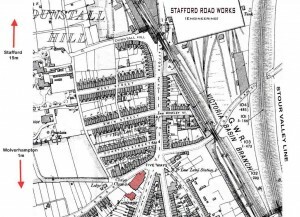 The principle employer being the Great Western locomotive works that straddled the road at Dunstall Hill, others of course adjoining the Birmingham Canal were Wolverhampton Gas Company, and The Electic Construction Company built on a triangular site nestling beneath Oxley Bank, Stafford Road and Bushbury Lane. The EEC produced heavy electrical machinery electric motors and generating equipment it closed in 1985. The Wolverhampton Science Park covers this site and and an area once used by the gasworks. The view just after the first World War from five ways looking towards Dunstall. Dominating the skyline are the chimneys of the Great Western railway works on Dunstall Hill. Brunel’s old bridge is seen in the centre, this will be demolished in the 30’s; as were many others in town to allow for the double decked trolleybus operation. This being a railway-workers enclave it’s not surprising that the public house names in the area reflected this. 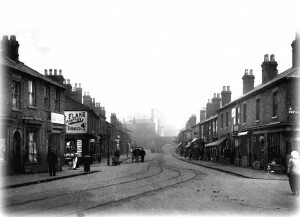 There was a ‘Great Western Inn’ on the corner of Moseley Street, a cul-de-sac, on the right in the picture. Then next door to the Pawnbrokers shop on the extreme left, was the ‘Locomotive Inn’. The five ways today is practically unrecogniseable, the culture has changed the shops have gone, now there is only small industrial units. There are now just four ways; the North Road, one of the principal routes into the town centre is now a cul-de-sac, and tower blocks now supply accommodation for the occupants of the former lost Victorian terraces that once dominated this area. 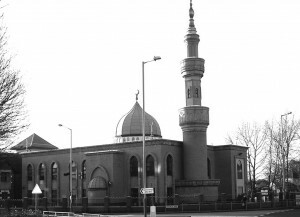 Today a Mosque stands on the site of the former Christ Church. 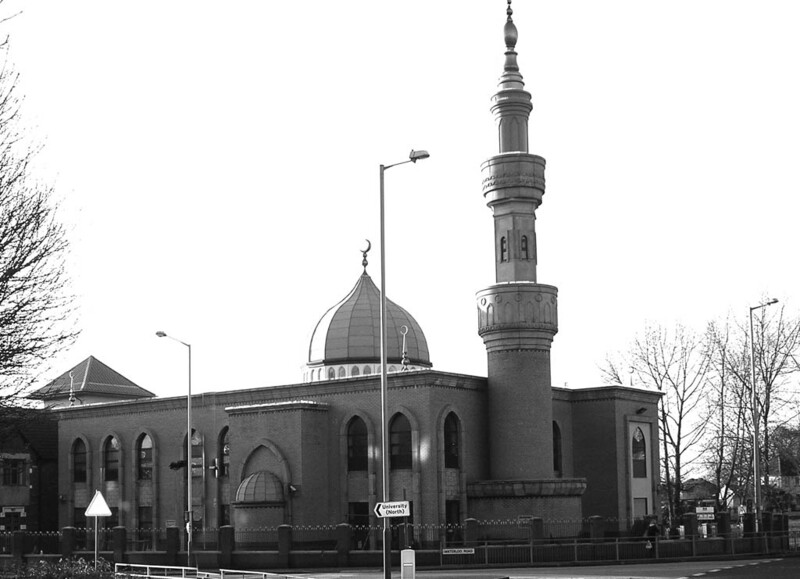 Regarding this new house of worship; I believe all has not been lost, we still have a fine building, albeit with a different form of enlightenment. The East came along in time to save all going West, so to speak. i remember albinos well. the people who ran it were brother and sister. On the subject of lost churches, re gardens, there is a lot of Queen St church all around the garden of a house not far from the old fox pub on the penn road, (its a restaurant now) also in the same garden was the font from trinity church Compton road, but sadly that has now been disposed of, Wonder how many people were christened in that ?. 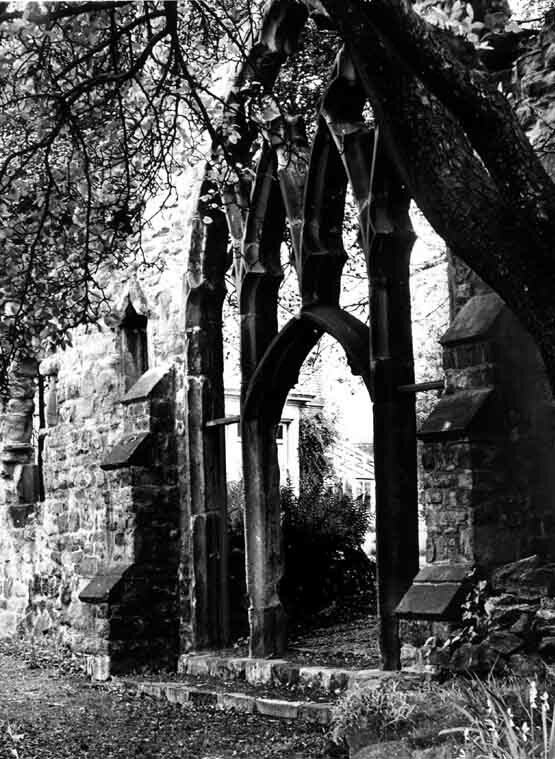 Thank You Mike If you are on Facebook check our group Lost Wolverhampton It would be interesting to start a thread on Old Church Ruins now in Wolverhampton Gardens and find out were they came from. I have picked this thread up through another post on FB. It has been 5 years since this was originally published. 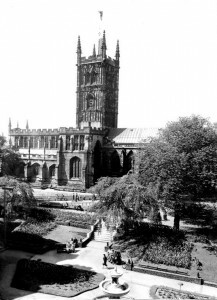 There have been so many interesting articles about Wolverhampton made over the years. I have travelled twice a day through 5 ways island since 2006, apart from the usual holidays and statutory days off, as I have worked on Gorsebrook Road since February 2006. I remember Gorsebrook Road also from the late 60’s early 70 ‘ s when I worked at the Goodyear Tyre and Rubber Co Ltd in their offices on the Stafford Road, when they were one of the biggest and best employers in the town. The town has changed tremendously, and not necessarily for the good, but who can stem the tide of progress when people genuinely believe that what they are doing is for the best. I don’t believe for a minute that anyone would tear down a building for spite or malice. It’s just that it’s difficult not to look back and think, we wish it was the way it used to be. Thank you for taking the time to post these articles. Thank you for getting in touch Lyn. Goodyears now there’s a name to conjure up many stories. I would say there aren’t many families in Wolverhampton who haven’t had someone working there over the years. including me beside other family members who worked there later. I had two Aunts that worked in the Tube Room just after Goodyears arrived in town in the late 1920’s. We also have a Facebook group (Lost Wolverhampton) and we find posts such as yours most interesting.